I the course of this column I have looked at how technology and design has directly effected rock climbing and mountaineering. Along the way we have seen that there has been many heroes who have transformed rock climbing from a sport for the daredevils to one that is now almost mainstream. If you will grant me the licence to step outside the tangible cause and effect and instead look at how technology has affected the climbing media then I hope to show you that the technology that has unpinned each successive human generation has had an effect on climbing through the media. Ever since even before the Matterhorn disaster and later the disappearance of Mallory on Everest the mainstream media has played a part in mountain climbing, usually through over dramatically highlighting terror. The early newspapers were partly power by the telegraph and later the radio to help speed up the lag time between an event an it’s reporting. It was however JFK vision for the future that would have the most marked effect on climbing. As part of his a major speech to the US Congress he not only started the Moon Race by stating within the decade we would place a man on the moon and return him safely to earth, but he also laid out the plan for earth orbiting satellites for communication. In doing so he inadvertently created a catalyst for a groundswell of change. The Telestar satellites that he help create were vitally important to a series of live outside broadcast that were focused on capturing rock climbers in action that started in 1963. Within microseconds of the events happening they could be broadcast live in the homes of anyone with a TV. Despite the immediacy of the medium of live outside broadcasts, climbing was invariable quite dull to watch and it took several experiments with the format to get it right. This ended in one of the breakthrough moments in rock climbing and arguably TV. When in 1967 the BBC planned what the celebrated Scottish mountaineer Tom Patey described as the greatest show on earth and another TV producer has called the first ‘Reality TV show’. The BBC dubbed it ‘The Great Climb’ and the ascent of the Old Man of Hoy captured the public imagination and 15 million people viewed it, or 30% of the population. How many of those viewers were turned into climbers or mountaineers is anyone’s guess. 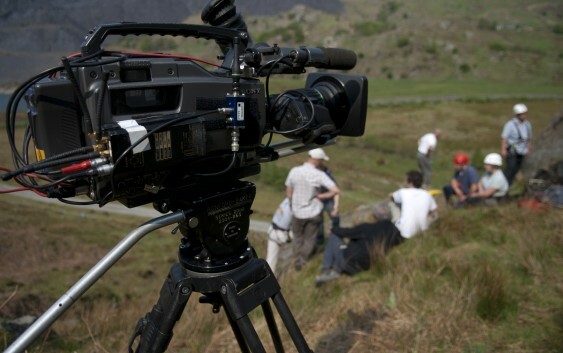 But as a result of those outside broadcast climbing had a few new national stars known beyond the climbing community. Joe Brown and Chris Bonnington were virtually household names, due to television. Whilst to a certain extent TV remained the main conduit for mainstream media for the next decade and half, a new invention was going to challenge how you got onto the small screen. The video cassette, meant that production cost plummeted and you no longer needed a rich backer to fund your film projects. In the UK a Welshman Alan Hughes was to cash in on this new phenomenon when he started filming climbers in action. His first videos were almost instance hits and included Total Control, a palm sweating montage of Big Jim Jewel soloing many classic extreme routes. Followed by the iconic Stone Monkey, a kind of rock-u-mentary about the ineffable Johnny Dawes; then finally the cult classic Gogarth that featured some serious air time. The production of these VHS videos still needed a decent production house or a favour to produce. Instead the next breakthrough in media was in 1991 when Tim Bernes-Lee started the world wide web, his vision for a free open source internet meant that the platform would soon become omnipresent in our lives. Now rather than wait for a climbing magazine or the next video to be released we could get the latest climbing news within hours or nowadays minutes of it happening, through what has been dubbed Citizen Journalism. The real watershed was when computers, video and the internet had their very own love child. No longer did you need a supercomputer to edit video. Anyone with a Mac could now essentially be production house and with Youtube to broadcast yourself. Fame could literally await anyone with a reasonable imagination, some basic skills and a story to tell, failing that a capturing a big fall or funny incident could make you go viral. Today simply trawling through the flood of climbing videos is painful as you sort wheat from the chaff. For whilst there are a few golden nuggets out there put together by one man and his laptop, there is also a veritable pile of dross as everyman and his dog uploads their latest unedited ascent of Cresent arête or Flying Buttress Direct, shot on their Go Amatuer or iPhone. What this has almost led to is the no proof, no glory culture. Whilst you might be the best climber in the world, unless you have your own videographer following you around like a lost sheep, making shorts about your latest rad sends then you are no one. The fact more and more hard routes are being filmed is making it harder for people to truly onsight routes. Consequently what people can flash having watched five youtube ascents of the route, has risen considerably. Years ago I made a film about North Wales Boulder, I posted it up for everyone to see for free. I was pleased to hear recently some young boulders watch it time and again to get the beta on different problems. Helping them save time, as they already have the beta, so its just a case of pulling hard, the ultimate in climbing by numbers. It make you wonder just whether in a few years we will be saying you tube-beta-flash it.